Pretty much all high-end client SSDs have no issues saturating the current 6Gbps SATA interface. We've talked about a move to PCIe based SSDs but these are the connectors that will do it. On the right you have SATA Express, which will deliver up to 1GB/s on PCIe 2.0 and up to 2GB/s over PCIe 3.0. On the left there's the eventual landing place: the SFF-8639 connector, good for PCIe x4 with speeds of up to 4GB/s (PCIe 3.0). Most client machines will likely use the new NGFF card form factor, but for huge capacities and performance (e.g. 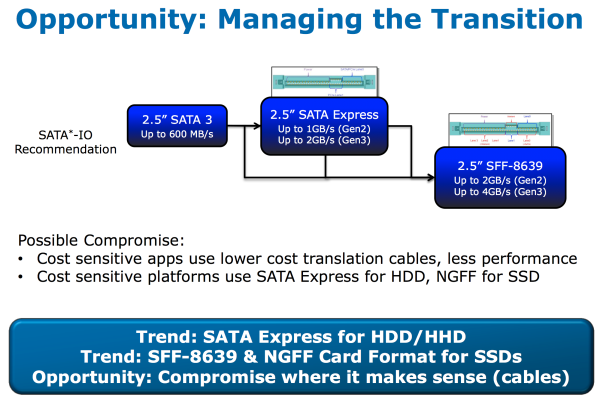 servers in the enterprise) we'll see a move from SATA to SATA Express to the SFF-8639 connector over the next few years. Faster SATA standards couldn't come fast enough indeed with SATA III limiting the performance of modern SSDs. However, I'm curious to know what will be the physical size of those new SATA connectors? Are we talking about something identical or similar in size to current SATA connectors, or something completely different? I ask because more and more people are moving toward smaller form factors for PCs, with Micro-ATX and Mini-ITX builds being more and more common. Unfortunately, the vast majority of the current crop of LGA1155 motherboards only have up to 4 SATA ports, with two exceptions (ASUS P8H77-I and JetWay JNF9A-Q67) neither of which are based on the Z77 chipset, meaning that you have no option if say you want an overclocked high-end SFF PC with a dedicated video card and 6 SATA drives. For example, the BitFenix Prodigy case support five drives + one optical and can support even more if you use a 3.5" drive bay that support two 2.5" drives or if you use the ICY DOCK MB994IPO-3SB 5.25" bay which supports a slim optical drive and two 2.5" SATA drives. It's an extension of the SFF-8482 SAS connector, i.e. the female socket will accept any standard 2.5"/3.5" SATA or SAS drive. Is SATA Express a new protocol or connection? So I read the post about NGFF and was like, "Heck, yeah. Finally." Then I read this one and was like, "WTF?" These connectors are physically compatible with current SAS/SATA power+data cables, but allow for devices that use 1 or 2 PCIe lanes instead of conventional SATA signaling. Or in the case of SF-8639, up to 4 PCIe lanes or an x2 SAS/SATA connection. So what about desktops? SATA Express and SFF are for servers and enterprise. And NGFF is for ultrabooks. SFF-8639 is for enterprise, replacing conventional SAS for SSDs using 2.5/3.5" form-factors. SATA Express is for the desktop, replacing SATA 6Gb/s for SSDs using 2.5/3.5" form-factors. The motherboard connector would appear to be backwards compatible with previous generations of SATA. You just need the right cable in order to utilize the fastest interface a given drive supports.